COBRA H.D. Degreaser was designed for use in Fleet Maintenance Facilities and similar types of Maintenance and Repair organizations. 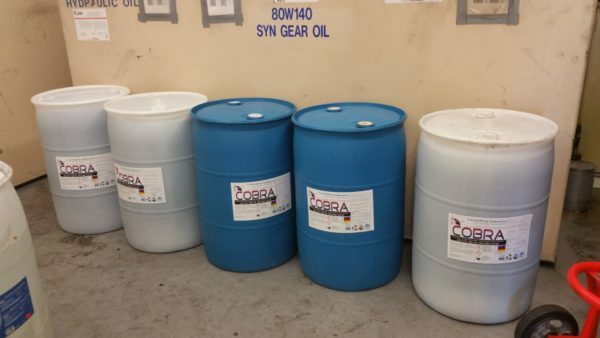 With a focus on performance and safety, we developed COBRA to outperform the competition while staying affordable. 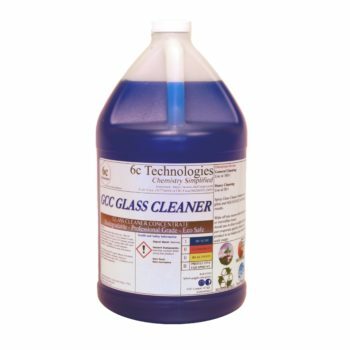 This Heavy Duty Eco-friendly Degreaser is the right tool for the job when cleaning floors, parts, tools and equipment. It features strong concentrated performance, eco-friendly biodegradable profile, Low VOC (SCAQMD Rule 1171g compliant, concentrated), non-caustic, non-phosphate, dual biodegradable emulsifiers, dual rust inhibitors, low VOC solvent and soft metal protectant. Save time, money, and minimize user risk with our premier eco-friendly heavy duty degreaser. Don’t see what you need? Need this product in a different size? Contact us and let us help you meet your goals. 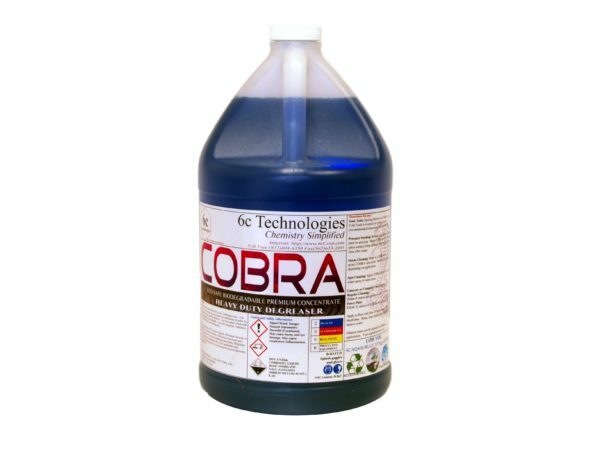 Soak Tank: Starting dilution for COBRA in a Hot/Cold Tank is 4 ounces per gallon of water (recommended temperature 160°F to 190°F). Pressure Washing: Remove large debris or chunks prior to spraying. Meter COBRA in at 9:1-18:1 and spray surface being cleaned. May require water rinse after usage. 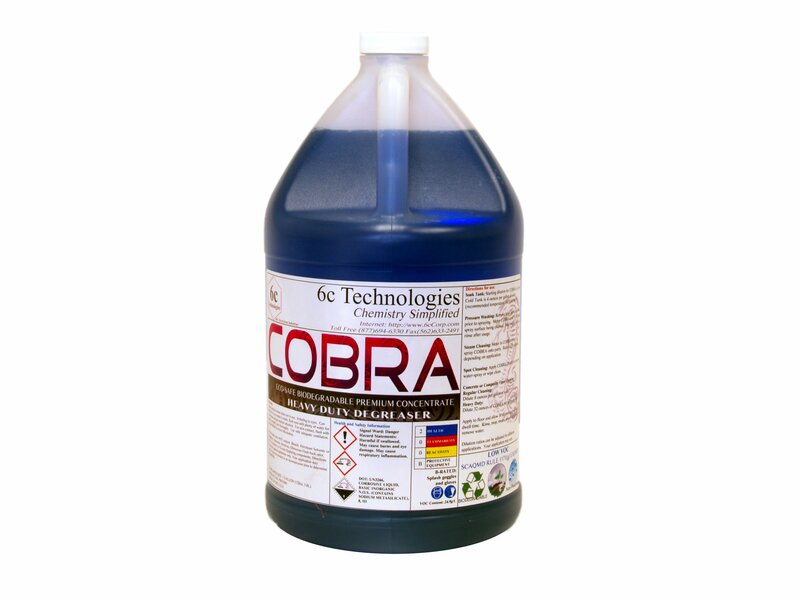 Steam Cleaning: Meter in COBRA at 64:1, or spray COBRA onto parts. Ratio can be adjusted depending on application. Spot Cleaning: Apply COBRA directly to area and water-spray or wipe clean. Regular Cleaning: Dilute 8 ounces per gallon of water. 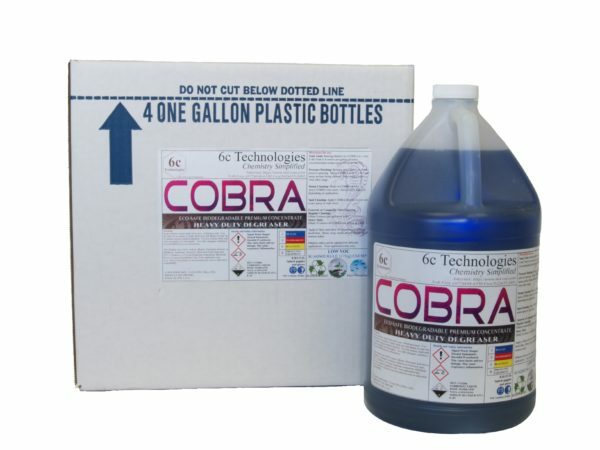 Heavy Duty: Dilute 32 ounces of COBRA per gallon of water. Apply to floor and allow 30 seconds to 2 minutes dwell time. Rinse, mop, media absorb or wet-vac to remove solution. © 2019 6c Technologies. Built using WordPress and OnePage Express Theme. Thank you! You will receive a phone call from us shortly.